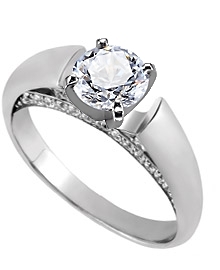 This unique 14k white gold 2.9 mm cathedral style engagement ring holds 26 - .010 carat round diamonds and 4 - .015 carat round diamonds with a color of G-H and a clarity of SI. The ring has a total carat weight of .32 carats. You choose your center stone from Danforth's inventory.